Before you read this report please be aware that most dust is caused by over forestation which exposes soil which would not normally be exposed thus wind dries it out and it then creates dust storms. 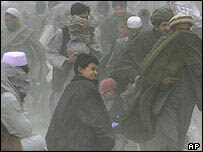 This dust then travels into the upper atmosphere on thermal updrafts and gets into the high atmosphere and then helps to trap heat which would normally escape and so global warming becomes a bigger problem The dust adds exponential value to the rate of temperature increase thus things will happen faster. There are other aspects of global warming and this is just one element. But the evidence is there for all to see. The huge amounts of dust blowing across the Earth may have serious consequences for the environment, a scientist says. Professor Andrew Goudie told a meeting of geographers dust was affecting human health, coral reefs and climate change. 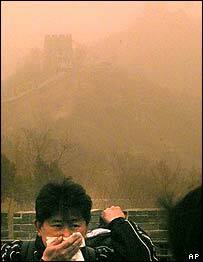 He said dust storms were becoming more frequent in some parts of the world, and transported prodigious quantities of material for very long distances. Professor Goudie was speaking to the International Geographical Congress in the Scottish city of Glasgow. Organised by the Royal Geographical Society with the Institute of British Geographers, its theme is "One Earth - Many Worlds". Andrew Goudie, professor of geography at the University of Oxford, said in his paper, Dust Storms In The Global System, that latest estimates of global dust emissions were about 2-3,000 million tonnes annually. Professor Goudie said: "Dust is one of the least understood components of the Earth's atmosphere, but one which may have a greater importance than has been realised up until now for climate change. "The cross-boundary nature of dust makes it a truly global issue and one that is not receiving the attention it deserves. "The importance of dust basins as a source of global dust is now being more widely understood and the magnitude of the environmental consequences identified." He said advances in satellite imagery had made it easier to monitor dust storms and locate the world's primary dust source, the Bodele depression in Chad, in central west Africa. In parts of North Africa, annual dust production had increased tenfold in the last 50 years, Professor Goudie said. 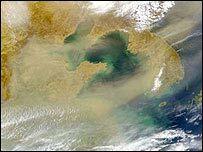 Dust storms transport large amounts of material for long distances, for example from the Sahara to Greenland and from China to Europe, which can cause problems far from the dust's source. The deposition of dust can affect the environment in several ways, including climate change, soil salinisation, disease transmission, ocean fertilisation, changes in ice cap albedo (reflectivity), air pollution and the neutralization of acid rain. One particular concern is the effect dust deposits could have on atmospheric levels of carbon dioxide (CO2), the main greenhouse gas produced by human activities. Increased amounts of dust can make the oceans more productive, by adding nutrients which encourage the growth of zooplankton and phytoplankton. Some would then draw CO2 from the atmosphere, altering carbon levels and affecting temperatures and rainfall. This in turn could have an effect on vegetation cover, leading ultimately to further production of dust, which is also important for climate because it both reflects and absorbs heat from the Sun. The main sources of dust are in the northern hemisphere - extremely arid areas containing old lake beds, alluvial fans, river plains and sand dunes. Drought, wind speed, increased grazing and deforestation all contribute to the formation of dust sources, as does the growing use of four-wheel-drive vehicles that can disturb existing dust deposits. Next March a team from University College London will make the first field study of Chad's Bodele depression to study the region's importance in global climate change. The research, supported by the RGS-IBG, will see whether dust in some areas is more important than pollution in affecting climate change.